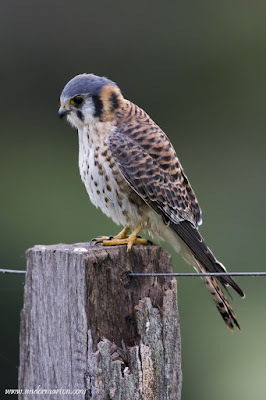 The American Kestrel (Falco Sparverius) is probably the most common New World falcon, it is widely distributed across the Americas, that means also in Brazil. During my 2009 trip in Brazil I stayed at three different places with different ecosystems - Fazenda Barranco Alto, Fazenda Baia Grande und Fazenda Ararauna. 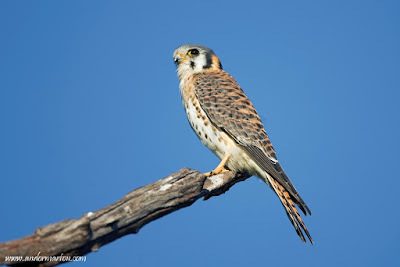 American Kestrel I saw only at Fazenda Ararauna. After the long transfer from Baia Grande to Ararauna and of course after the welcoming barbeque :-), we (with the guide) decided to explore the surroundings of the Fazenda. 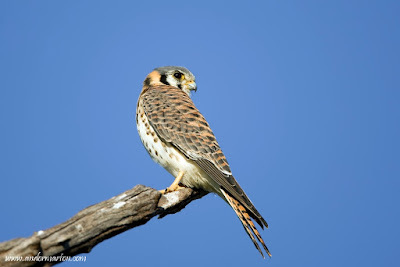 Just behind the houses we spotted some spoonbills and a very relaxed kestrel sitting on a perch. The light was perfect so I managed to take a pretty large series from many different angles. Being afternoon the bird was pretty lazy, so after the several portraits we decided to head to the birdwatching tower, where we stayed till evening. The next day morning I went back to that tree, where I saw the day before the kestrel. She was not there, but after 10 minutes she made her presence known. Unfortunately the light was bed, cloudy, no sun at all and this is also noticeable in the quality of the pictures ... my camera is definitively not a high ISO performer. 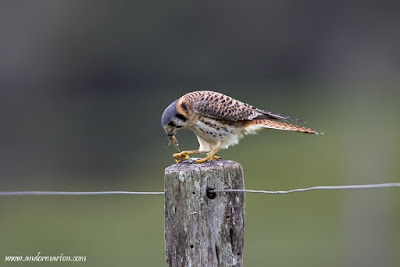 The bird tried several times to catch some food and finally caught a suculent grasshopper. 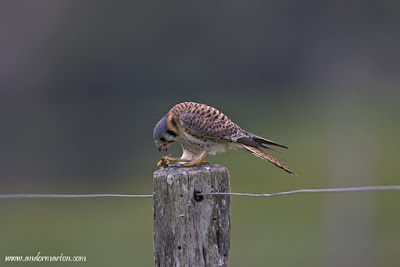 After this quick breakfast she flew away and didn't come back. The rest of the day I spent on the boot trying to photograph a fishing great egret with some success. The egret pictures I will post later. 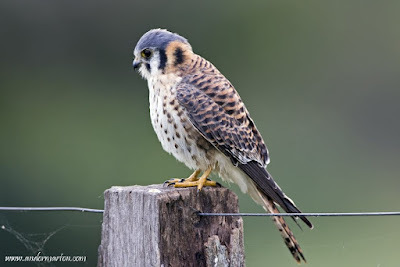 The third day was rainy, against the rain I took a quick tour around the fazenda, but it was no sign of bird activity or kestrel. what a ... ? Do I need to land here? Hmmm ... nothing there ... or did she only check her nails? Incredible series on this dream raptor. Lovely. I agree with Thomas, this is a fantastic set of pictures. I love the feeding sequence a lot. It is quite rare to get pictures of that!!! Awesome! Superb set Andor. What a beautiful bird. I especially like those on the post. Thanx guys. 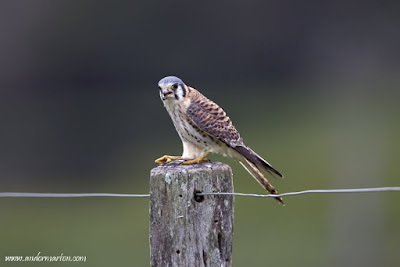 It was a pleasure to photograph this bird. Nagyon jo a madaras sorozat, van par kivalo kep koztuk, en is gondolkodtam madarfotozason , tegnap vettem egy soligor 60-300as manualis obit es lehet nekifogok "lovoldozni" en is. @szabi - kosz a benezest. Ha tetszik es van turelmed meg idod hozza, csak batran. 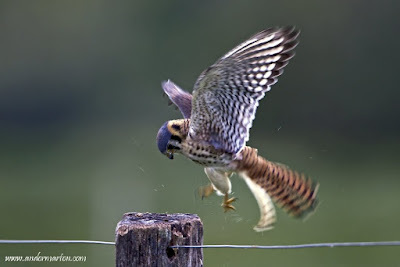 It's interesting to see that Brazil has the same raptor that we do up here in such a completely different environement. Fun series of shots Andor. Just to answer your question on my blog. Now i did not use any flash light. The sun was being me and the nice light in the eye is natural!! Thanks for passing by! 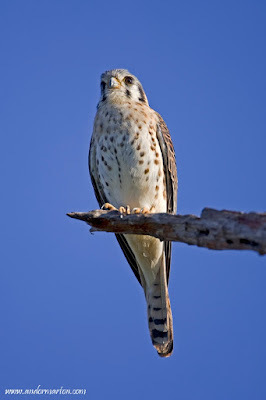 The small and elegant Kestrel is one of my favourite birds. You took a very nice serie. 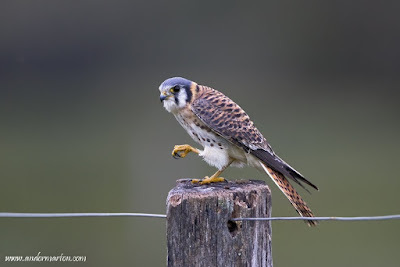 @dominic - welcome on my blog and thank you.